Chuyên bán Laptop HP Mobile Workstation 8560w - HP 8560w I7-2760QM, Ram 8G, HDD 500G, VGA Nvidia Quadro 1000M 15.6 inch, HD+ 1600x900. Giá bán HP8560W 8.5 triệu - hàng Mỹ. 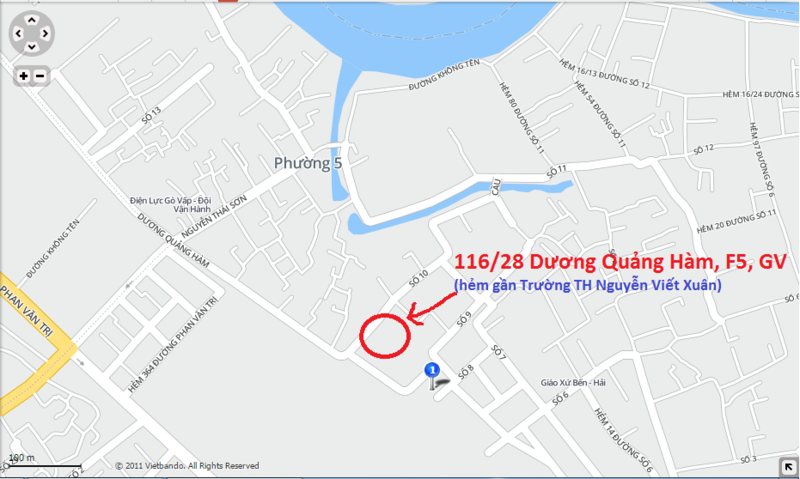 HP workstation 8560W, games đồ họa tốt. Elegant, more elegant, EliteBook. Are you looking for a robust, well-equipped and strong workstation? If you are, you might like the EliteBook 8560w. 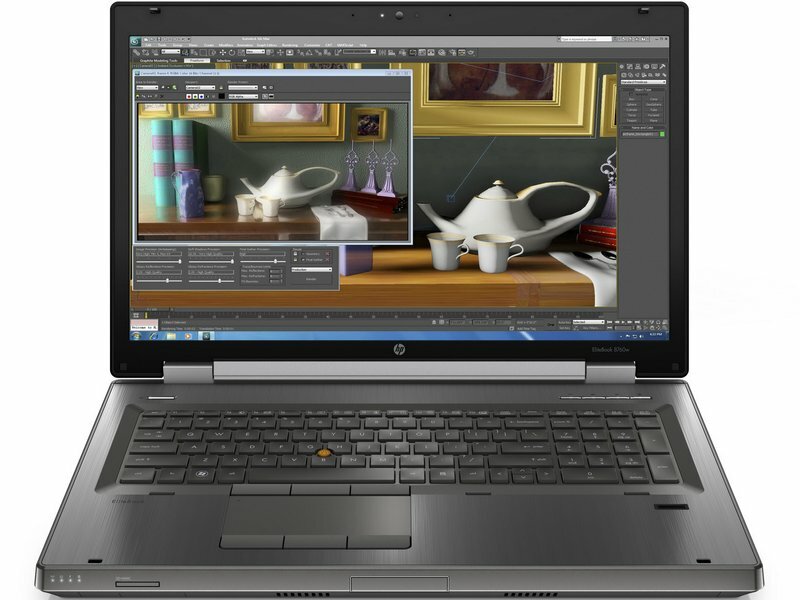 HP builds a top rate workhorse that can live up to almost all challenges at a premium price. Mobile workstations are aimed at a specific group of consumers. Those are customers who don”t explicitly use a notebook for Internet, games or music, but work with professional, performance demanding programs every day. The requirements are accordingly high: Besides the performance, the input devices, the screen and the features have to be just right. 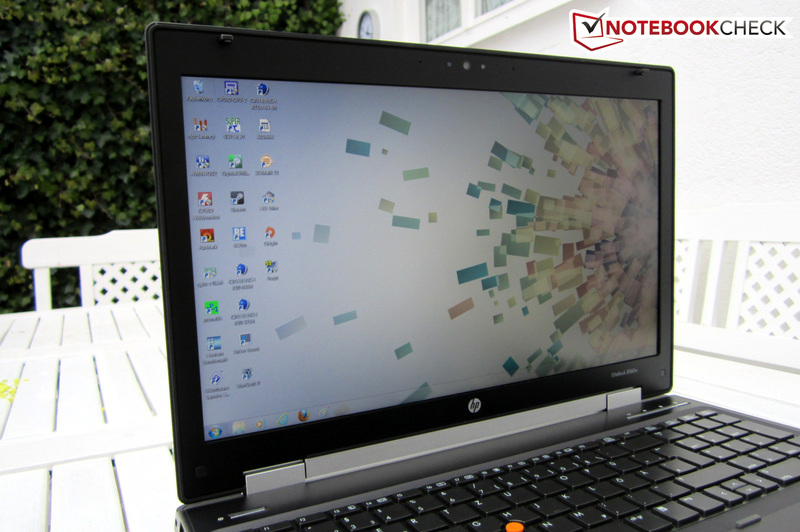 HP tries to meet exactly these criteria with the EliteBook 8560w. We checked whether the workstation really belongs to the absolute top devices with the LG660EA. The buyer gets a fast Intel dual core CPU (Core i5-2540M) and a powerful professional GPU from AMD (FirePro M5950) for just under €1450 (RRP: €1650). A four GB DDR3 RAM and a 500 GB HDD isn”t anything special in comparison. The display is all the more interesting: The 15 inch non-glare screen has a generous resolution of 1920x1080 pixels. Is it worth its money? Our test version sooner belongs to the low-priced alternatives among the currently available models. Alternatively, even stronger versions equipped with a quad core CPU, 8 GB of RAM and an Nvidia Quadro 2000M graphics card are available for over €2000. At first glance, the 15 inch case looks fairly bulky. With a height of almost four centimeters and a weight of roughly 3.3 kilograms (compare W520: 2.7kg, M4600: 3.16 kg), the workstation is neither slim nor light - quite the opposite. The thick build however also has its advantages: The EliteBook can score with an excellent stability. The base unit particularly stands out since the top and bottom don”t yield noticeably even under stronger pressure. The business device even looks good. HP uses an elegant and high quality mix of silver-gray plastic and metal surfaces (lid and keyboard area are made of aluminum). The design is basic and timeless, whereby the angular shape won”t appeal to everyone. The hinges also convince us. After pressing the opening button (unlocks the hooks of the lid), the notebook can be opened easily with one hand. The base unit doesn”t lift; the screen is held in place sufficiently during surface vibrations. When taking a closer look, there are a few minor flaws in details. For one thing, the workmanship of our test device wasn”t quite perfect (protruding keyboard corner, partly irregular gaps). For another, many users will likely be annoyed by the three rubber protectors that HP has placed below the keyboard. All in all, the keyboard makes a good lasting impression. Except for (rather unusual in the professional field) HDMI, all important interfaces are available. In addition to two video outputs (VGA & display port), two audio jacks (headphone & microphone) and five USB ports (2 are USB 3.0), the workstation accommodates a card reader, an ExpressCard slot and an eSATA, respectively FireWire port. Beyond that, a docking station and a secondary battery can be connected to the bottom (available as accessories). The interface distribution is certainly a matter of taste - in the author”s opinion the lateral ports have been placed too far front. Users who connect many external devices will frequently have to cope with cables when using a mouse. In this case, the use of a docking solution would be recommended. Not only a wireless Internet connection via WLAN b/g/n (Intel Advanced N 6205) or Bluetooth 3.0, but a cabled connection via RJ-45 Gigabit LAN is possible. A few users will also be pleased about the RJ-11 port (modem). Security is a major issue in the EliteBook 8560w. Various software and hardware based solutions are to protect the 15 inch device from third-party access. Among other things, there is a fingerprint scanner, a Kensington Lock, a smart card reader, a TPM chip and a HD webcam with face recognition. The EliteBook also comes with plenty of software. We limit ourselves to the "HP Power Assistant" and the "HP ProtectTools Security Manager" in this article. While the former program is used for monitoring the power consumption, various security features can be managed with the latter tool (HDD encryption, passwords, biometrics, etc.). However HP again overdoes it: The notebook is so stuffed with programs in its state of delivery that the operating system boots rather slowly and can only really pick up speed after a few minutes. A slimmer installation or a faster mass memory (keyword: SSD) might help here. There”s no reason for complaint in view of the scope of delivery. Apart from the compulsory additions, such as power adapter (120 watts) and battery (8 cells with 75 Wh), the buyer will discover several info brochures, a driver DVD and a recovery DVD for recovering the operating system (Windows 7 Professional 64 bit). Commendable: HP grants a three year warranty on the laptop. In some countries, the device is picked up in cases of damage. Naturally, HP also offers upgrades within the framework of its "eCare Packs", for example an onsite service for the next business day (approx. €130). The input devices are definitely worthy of a business machine. The chiclet design keyboard (freestanding keys) stands out with a perfect layout and a well-defined typing feel (adequate sound). That and the good key size (15 x 15 millimeters) result in high work suitability. We only have to criticize the small, center arrow keys and the rather narrow enter key. The dedicated numpad and the four handy special keys (WLAN, volume, web & calc) compensate for this though. 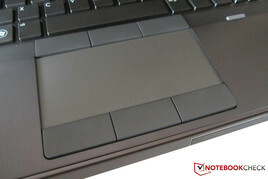 The manufacturer has also done a good job with the touchpad. The touchpad proves to be well designed thanks to the generous size (110x50 millimeters) and the fairly smooth surface - despite the rubber coat. The slight lowering, the switchable scroll bars and multi-touch support (various gestures) are further bonus points. There is at most room for improvement in the accuracy: The touchpad sometimes responded a bit spongy. In the meantime, the three mouse keys convince with a pleasantly soft pressure feel. When desired, the touchpad can also be completely disabled. 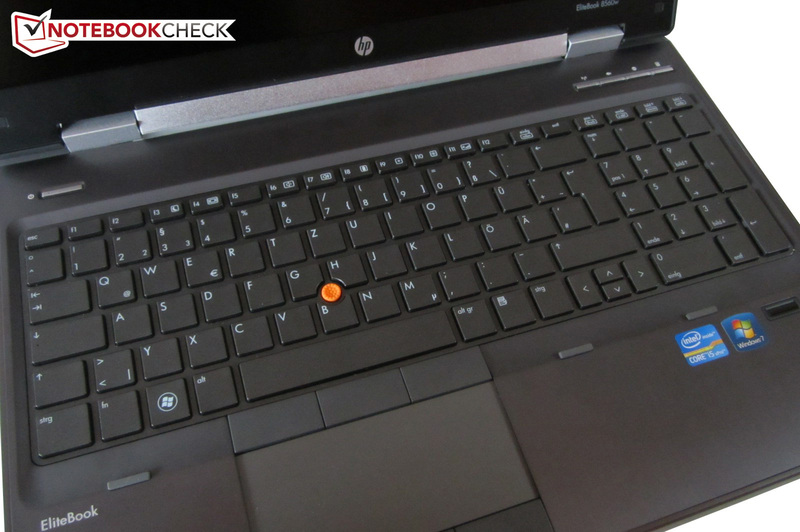 There is an orange "PointStick" in the keyboard”s center, which can be used as a touchpad replacement together with the three additional keys. Of course, inputting still works best with an external mouse. Caution is called for with the screen since there are three different versions used depending on the model. The cheaper devices only have a HD+ screen with a resolution of 1600x900 pixels. 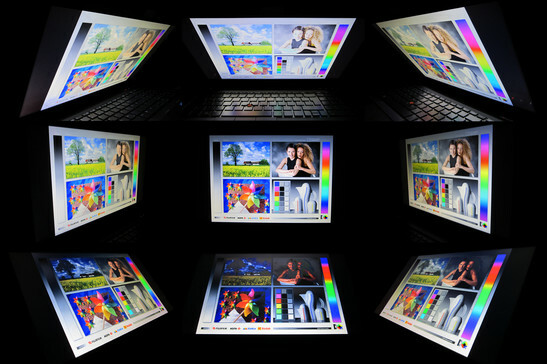 The top models can boast with especially true color fidelity (DreamColor) and viewing angle stable (UWVA) Full HD screen. 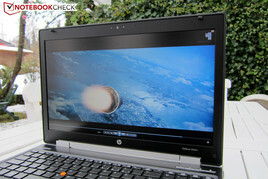 The EliteBook 8560w-LG660EA that we reviewed also has 1920x1080 pixels, but no DreamColor technology. All models have a non-glare surface, an LED backlight and a 16:9 aspect ratio in common. Professional users naturally will want a high image quality. HP knows this: The built-in LG Philips screen (LP156WF1-TLF3) should satisfy most buyers. The brightness is more than good with around 236 cd/m2. The black value is also satisfactory: 0.47 cd/m2 don”t let dark elements look too grayish. An above average contrast of 536:1 is also part of the screen”s specs. The colors are relatively strong and the sRGB spectrum is fairly well covered. On the other hand, it”s not enough for the Adobe RGB color spectrum (see screenshot). The matt surface and the good brightness ensure a comfortable outdoor use. In contrast to the glossy counterparts, reflections are hardly an issue and the eyes aren”t unduly strained. HP has even remembered to install an ambient light sensor, which adapts the brightness automatically at a push of a button. The viewing angles are better than in most laptops. Even larger deviations from the sides and from above at an angle don”t lead to a change in the picture. There”s only a bit of room for improvement from an oblique perspective. The EliteBook 8560w is equipped with one of the latest Sandy Bridge processors from Intel. While a few models have a future-proof quad core, the reviewed LG660EA has to be content with a dual core. 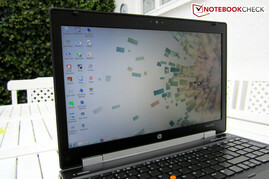 Nevertheless, the notebook doesn”t lack power: The Core i5-2540M belongs to the strongest mobile models. Thus, the CPU manufactured in 32 nm lithography can serve with 624 million transistors and a 3 MB L3 cache. In comparison: Intel”s own quad core contains 995 million transistors and an L3 cache of up to eight MB. A default clock of 2.6 GHz and a maximum clock of 3.3 GHz (automatic overclocking via Turbo Boost) are also impressive. Additionally, the Hyper Threading technology simulates two virtual cores in the system. Thus, four parallel threads are possible together with the two physical cores. However, not every program benefits from that. The developers still have to optimize their software accordingly. More highlights are support for VT-x, respectively VT-d (hardware visualization) and Intel”s vPro technology. vPro stands for extensive security and management functions. In view of the given performance and the numerous features, a TDP of 35 watts (Core i7 range: max. 55 watts) is acceptable. Since HP has omitted GPU switching, the integrated graphics chip HD Graphics 3000 remains disabled. Too bad for the battery life. Now we”ll take a quick look at the automatic overclocking. While the Core i5-2540M clocks with 3.2 - 3.3 GHz when one core is loaded (according to Intel Monitor), it was an average of 3.1 GHz when all were loaded. The CPU ran with at least 2.9 GHz even in the demanding stress test (Furmark & Prime). The Core i5-2540M has to prove its abilities in Cinebench R10 among other benchmarks. The performance in single core rendering particularly earns respect: With 5174 points, the CPU places itself almost 6% in front of the entry quad core i7-2670QM (~4900 points). When multiple cores are loaded, the Core i5 2540M falls back strongly: 11242 against 18000 points speak a clear language (multi core rendering). The dual core doesn”t stand a chance in Cinebench R11.5 either. The quad core calculates approximately 70% faster (2.93 vs. 5.1 points). Ergo: If the notebook is to last for as long as possible and/or programs are used that are heavily multi-threaded, a model with a Core i7 quad core should be preferred. HP either installs Nvidia”s Quadro 1000M or the 2000M, or AMD”s FirePro M5950. These aren”t the classic consumer models, but alternatives for professional users. The FirePro M5950 is a DirectX 11 capable graphics accelerator of the upper midrange and its specifications are very similar to the Radeon HD 6770M: 716 million transistors, 480 Unified Shaders and a 1024 MB GDDR5 video memory (128 bit interface) are only a few of its features. The clock rates are 725 MHz (core) and 900 MHz (memory). HD videos are accelerated via the UVD 3 decoder and the graphics card can transmit a surround signal via HDMI. The FirePro M5950 is made in a 40 nm process. Since HP didn”t have an updated drive available at the time of the review, we used the installed version 8.821.1.7000 that is a few months old. 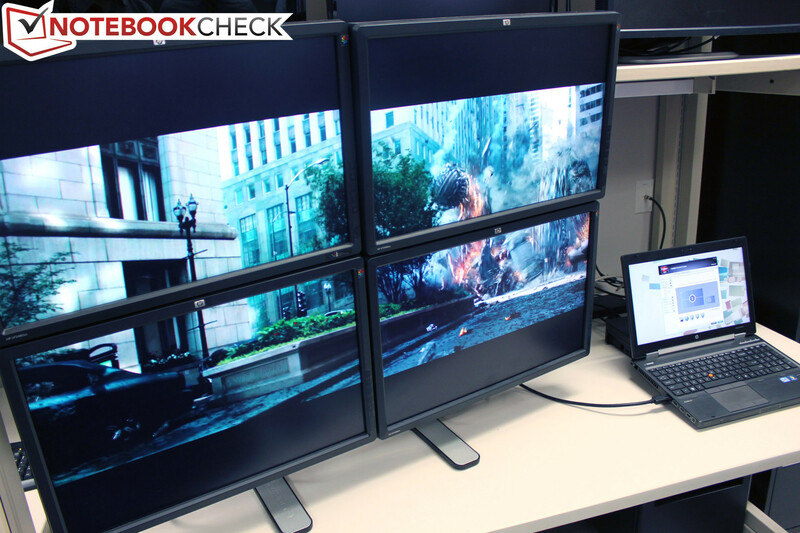 By the way, the graphics card can feed up to five monitors with video material when the docking station is used (Eyefinity). The FirePro M5950 gives a good show in SPECviewperf 11 (tests several CAD programs). Although the AMD graphics card can”t quite reach Nvidia”s Quadro 2000M (advantage of 21%), the Quadro 1000M is slightly surpassed by 11%. In the meantime, the FirePro M5950 looks like an old hat compared with the wickedly expensive high end models, Quadro 4000M (+51%) and Quadro 5010M (+63%). The DirectX 11 performance is approximately on a par with the Radeon HD 6770M: 1350 points in 3DMark 11 (1280x720, Performance setting, GPU score) and 18.1 fps in the Unigine Heaven 2.1 benchmark (1280x1024, high, default tessellation) are above average. Weaker midrange graphics cards, like the GeForce GT 540M, only achieve about 900 points, respectively 14 fps. A 2.5 inch HDD from Hitachi is installed in our test device. The HTS725050A9A has a capacity of 500 GB and bids a good performance thanks to 7200 rpm. 93 MB/s in sequential read and 92 MB/s in sequential write aren”t possible with most HDDs (CrystalDiskMark). The access speed of 16.8 ms is also impressive (HDTune). Nevertheless, it”s advisable to upgrade to a solid state drive if possible. Cutting edge SSDs speed up Windows routines noticeably; load times, installations and data transfer benefit besides the boot process. Heavy multitasking tends to force HDDs to their knees. The venerable PCMark Vantage confirms the 15 inch device”s very good performance. 7768 points are typical for a device of the upper midrange. However, a lot more would have been possible with a solid state drive as a look at the Fujitsu Celsius H710 reveals: Despite a weaker graphics card (Quadro 1000M), the business notebook manages more than twice as many 16268 points. Although the FirePro M5950 is designed for the professional field, the graphics card is great for gaming. Older and less processor-intensive tracks, such as Fifa 12, StarCraft 2 or Call of Duty: Black Ops can very well be enjoyed in the native 1920x1080 pixels with high graphic settings and antialiasing. On the other hand, current blockbusters, like Battlefield 3, Anno 2070 or Skyrim only run smoothly with a lowered resolution and reduced details. Tip: 1600x900 pixels represent a good compromise of image definition and resource consumption. Graphical errors or unusual performance drops didn”t turn up in any of the twelve tested games. The performance roughly corresponds to the Radeon HD 6770M with slight advantages in favor of the FirePro M5950. In contrast to SPECviewperf 11, the Quadro 2000M doesn”t have the lead here. The performance doesn”t cave-in excessively on battery power. As can be seen on the following chart, the graphics card only processes marginally slower. The processor is sooner afflicted - the Cinebench R10 result decreased by almost 20%. 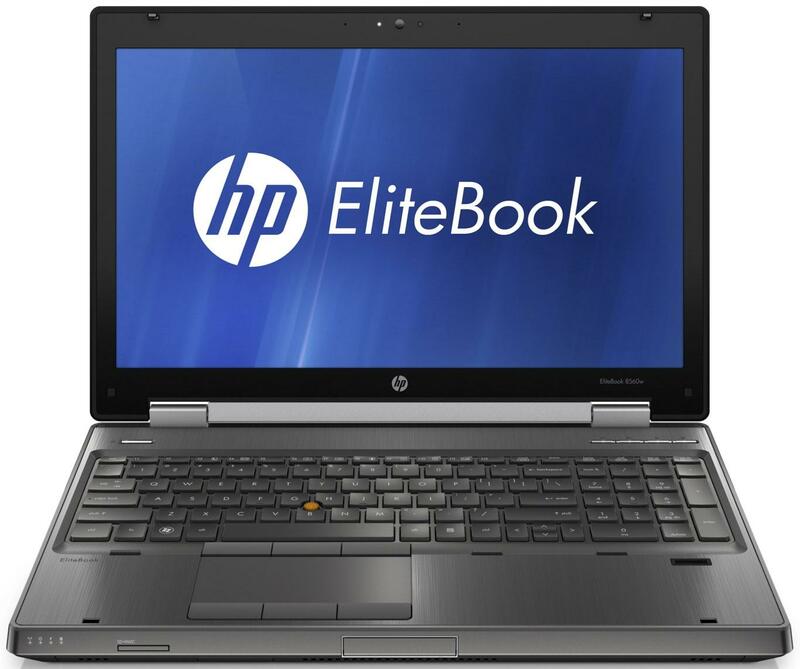 The fairly high noise development is one of the few weaknesses of the EliteBook 8560w. In 3D operation, the case fan rotates at a very audible level and is only drowned out by louder ambient noises (stereo system, television, etc.). Moreover, the fan occasionally emits an annoying whistle during higher load. The laptop first gets disturbingly loud during unrealistic full load. We measured almost 50 dB (A) at a distance of 15 centimeters. The notebook naturally works a lot quieter in idle mode, whereby the fan never stops work completely. The noise level is quite constant, apart from the fan”s odd speed increase. As long as data isn”t accessed, the DVD burner”s noise is also acceptable. The majority of buyers will likely find the emissions acceptable. The case”s temperatures don”t give reason for complaint. The base unit stays fairly cool in idle mode - approx. 30°C are an acceptable rate. As usual, the fan”s region heats up particularly during 3D operation; we could measure a maximum of 37°C on the top and a maximum of 44°C on the bottom. Great: The wrist rest doesn”t get disagreeably warm even during higher load. We ran the tools Furmark and Prime in order to record the component”s temperature development. While the GPU heated up to 70°C, the CPU almost exceeded the critical 100°C mark according to HWMonitor. However, throttling was not observed. The performance was always perfect (the components are a lot cooler under normal circumstances). Both speakers, hidden on the case”s front, supply a feasible sound - at least with enabled SRS technology. The sound loses volume and gets noticeably dull without the audio enhancement (see picture). The speakers can be turned up surprisingly high, but tend to fray gradually. Although the sound quality isn”t at all bad, headphones or an external system should be used when possible. Notebooks with good speakers are a scarce thing. The lack of graphics switching is especially noticed in idle mode: With a power consumption of 18-24 watts, HP”s EliteBook uses almost twice as much power as the Lenovo ThinkPad W520 equipped with Nvidia”s Optimus-technology (8-17 watts). That is completely different during load: Instead of 150 watts (ThinkPad), the EliteBook consumes a maximum of 105 watts. Note: The ThinkPad W520 used for the comparison was equipped with a quad core CPU. As already indicated, the battery runtimes aren”t overwhelming. The notebook turns black after a runtime of only one hour when the laptop is put under heavy load. There”s a bit more time for playing a movie: Our test DVD ran for roughly 1.75 hours (maximum brightness). We could surf on the Internet for nearly 2.75 hours (medium brightness). More than three hours can only be accomplished with the lowest brightness level. Other workstations offer a much higher mobility (see the Dell Precision M4600). The strengths of the EliteBook 8560w-LG660EA clearly prevail. The combination of Intel”s dual core processor and AMD”s professional graphics card speeds up most applications perfectly. The FirePro M5950 is also impressive even aside from CAD programs. Like our benchmarks prove, the 15 inch laptop is even suitable for the latest games. Beyond that, we have the robust and connectivity-eager case that can score with great input devices and a high-end screen on the pro side. (Users with image or video editing ambitions should take a model with DreamColor technology). Security is also an important issue. 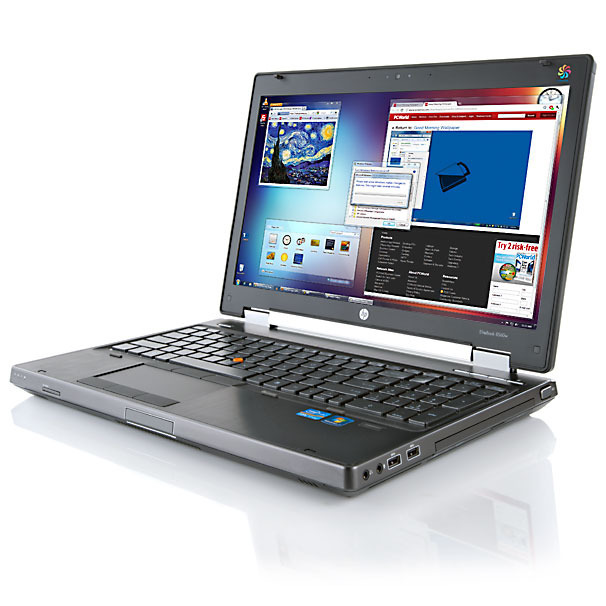 HP has installed a number of software and hardware solutions. Small details such as the long warranty period (three years) and the included recovery DVD add sympathy points. Nevertheless, the EliteBook 8560w doesn”t accomplish the rating "Very Good". In addition to its high weight (~3.3 kilograms), we have to criticize the poor battery life and the noise development - the notebook isn”t exactly quiet. The battery life could be improved with a graphics switching in the meantime. HP should also work on the cooling: The Core i5-2540M climbed to almost 100°C in the stress test. Overall we can give the EliteBook 8560w a purchase recommendation anyway. HP has put visible effort into the development. 15 inch alternatives would for example be the Fujitsu Celsius H710, the Lenovo ThinkPad W520 or the Dell Precision M4600.